Friday’s last-minute contract negotiations between Denver Public Schools and the teachers union ended with no deal reached beyond an agreement from both sides to come back to the bargaining table Saturday. 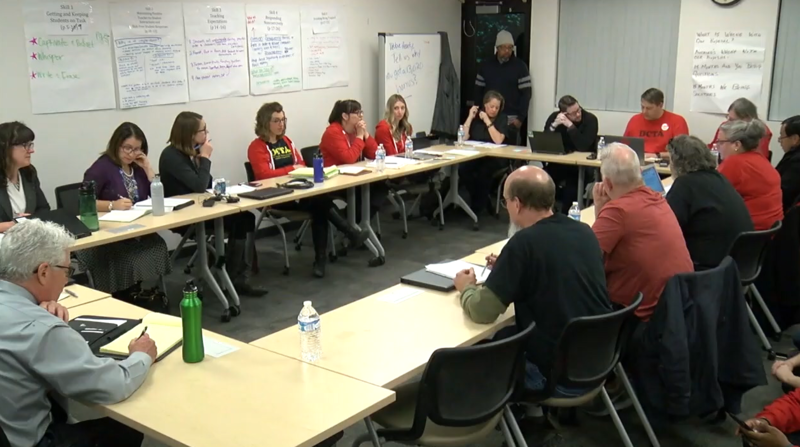 DENVER — Friday’s last-minute contract negotiations between Denver Public Schools and the teachers union ended with no deal reached beyond an agreement from both sides to come back to the bargaining table Saturday. If a deal isn’t reached by this weekend, Denver teachers will walk off the job Monday morning. Members of the Denver Classroom Teachers Association said minimal progress was made during Friday's session. However, DPS Superintendent Susana Cordova said she was happy with the progress made. During the exhaustive session, the district unveiled multiple ways to grow pay. Teachers would be rewarded for 10 years of service with DPS, something that has never been done before. But union members said the proposal still falls short. The union, which represents 5,635 educators in the Denver Public School system, has been trying to negotiate a new pay structure with DPS for the past 14 months. The main sticking point is increasing pay and lessening teachers' reliance on one-time bonuses. The walkout has been on hold as the state decided whether to intervene at the school district's request. But on Wednesday, Governor Jared Polis declined to do so, hoping both sides will work through the weekend to come to an agreement. The union praised that move and they immediately declared that teachers were prepared to strike come Monday. DPS officials reassured parents that school would be open Monday if a settlement isn’t reached and a strike proceeds. The district has 1,500 guest teachers in its database and as already offered positions to at least 300 applicants.